FLiCKERFEST 2018 IS ON THE ROAD TO MELBOURNE AND NEWCASTLE! The Flickerfest Tour is underway and we are super excited to be heading to Melbourne next week with some unique programmes! First off on Valentine’s Day, the 14th of February is our specially curated Best of Melbourne Shortsprogramme showcasing the filmmaking talents of local filmmakers drawn from our Bondi competition programme, including the stunning Oracle from Zohie Castellano and the adorable Mrs McCutcheon directed by John Sheedy. On the following night, the 15th of February we will be bringing the very best shorts from across the EU continent in our special showcase programme Best of EU Shorts, with thanks to our partners The EU Delegation in Australia including the Academy Award nominated short out of Germany Watu Wote (All Of Us). The following weekend we head north to Newcastle with the Best of Australian Shortsprogramme which will include Melon Grab, directed by the Newcastle born and bred Director Andrew Lee. The film was shot in and around Newcastle by fellow Newcastle born Dane Howell who took home the award for Best Cinematography in an Australian Short Film at our awards ceremony in Bondi in January. Included in our Short Laughs Comedy programme is the winner of our Academy® Accredited Best Australian Short Film On Hold. This delightful musical was Directed and Composed by the Newcastle raised Jake Nielsen and Matthew Predny who studied together at the Broadmeadows School of the Performing Arts! Come along and support local award winning filmmakers, have a chuckle and check out the stories coming out of Europe! 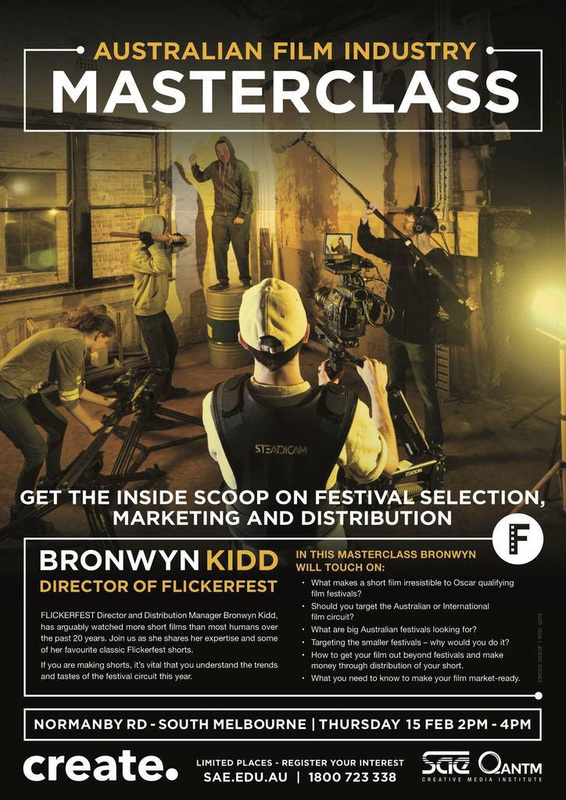 FILMMAKING MASTERCLASS WITH FLICKERFEST DIRECTOR BRONWYN KIDD! Get the inside scoop on Festival Selection, Marketing and Distribution with Flickerfest Festival Director Bronwyn Kidd. and tastes of the festival circuit. Come and learn how to make your short film Festival and market ready!